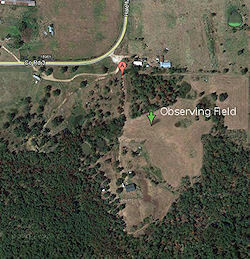 The Arkansas/Oklahoma Astronomical Society would like to invite you all to a weekend of observing and fun at the Diamond Bar G Ranch Star Camp located west of Fayetteville, Arkansas. The Star Camp is scheduled to be held the weekend of Oct 21 - 23. While it may conflict with other star parties this fall, this is the only weekend that the Diamond Bar G Ranch will be available for an event of this type that is not during a full moon. Since the RRAC's Burger Burn events will not be held this year, AOAS thought this might make a nice alternative. The Diamond Bar G Ranch Star Party is a casual event with no registration fees and no planned schedule, other than a pot luck dinner on Friday evening, Oct 21st. We will not be having speakers or any other type of program. The purpose of the event is to do observing in a fairly dark-sky location without a lot of time devoted to other pursuits. The observing field is wide so there is a clear view to the south and east, with low tree lines to the north and west. The Diamond Bar G Ranch is located in the Bortle Class 2 (blue) Zone, so light pollution is minimal. There are light domes from both Fayetteville in the NE and Van Buren / Fort Smith in the south but they are not obtrusive, and are usually only visible when there is cloud cover. The Milky Way is easily visible with the naked eye on clear nights. This artist's concept shows NASA's two Voyager spacecraft exploring a turbulent region of space known as the heliosheath, the outer shell of the bubble of charged particles around our sun. Image credit: NASA/JPL-Caltech. The recalculation is prompted by data from NASA’s Voyager 1 probe, now 18 billion kilometers from Earth. 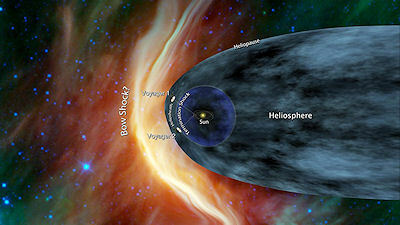 Voyagers 1 and 2 were designed and built and are still managed by NASA’s Jet propulsion Laboratory. Aging but active, the spacecraft have been traveling toward the stars since 1977 on a heroic mission to leave the solar system and find out what lies beyond. Previously, researchers thought the crossing was still years and billions of kilometers away, but a new analysis gave them second thoughts. Krimigis and colleagues combined Voyager data with previously unpublished measurements from the Cassini spacecraft. Cassini, on a mission to study Saturn, is nowhere near the edge of the solar system, but one of its instruments can detect atoms streaming into our solar system from the outside. Comparing data from the two locations, the team concluded that the edge of the heliosphere lies somewhere between 16 to 23 billion kilometers from the sun, with a best estimate of approximately 18 billion kilometers. Because Voyager 1 is already nearly 18 billion kilometers out, it could cross into interstellar space at any time — maybe even as you are reading this article. 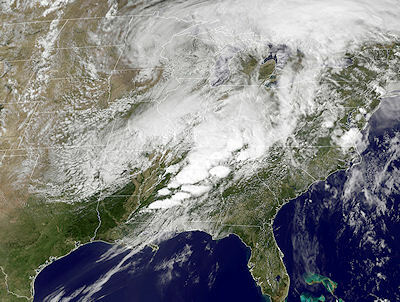 This GOES image shows the storms that spurred the intense April 27 tornado outbreak in the southern U.S. Animation showing the development of weather can be seen at http://earthobservatory.nasa.gov/NaturalHazards/view.php?id=50347. To fine-tune tornado warnings, NOAA will soon launch the first in a series of next-generation weather satellites — GOES-R (Geostationary Operational Environmental Satellites-R series). The spacecraft is brimming with advanced sensors for measuring key ingredients of severe weather including winds, cloud growth, and lightning. The lightning mapper will detect and map not only cloud-to-ground lightning, but also bolts within and between clouds. The kind of cloud-to-ground lightning we see from our front yards accounts for only 15-20 percent of total lightning. To get a clear idea of a storm's intensity, meteorologists need to know about all the lightning — a view GOES-R can provide. Find out more about GOES-R’s unprecedented capabilities at http://www.goes-r.gov. Young people can learn more about tornadoes and all kinds of other weather at http://scijinks.gov. Young red dwarfs produce a telltale glow in the ultraviolet part of the electromagnetic spectrum that Galaxy Evolution Explorer can sense. Because dwarf stars are so numerous — as a class, they account for more than two-thirds of the stars in the galaxy — astronomers could reap a rich bounty of targets. Astronomers know of more than five hundred distant planets, but very few have actually been seen. 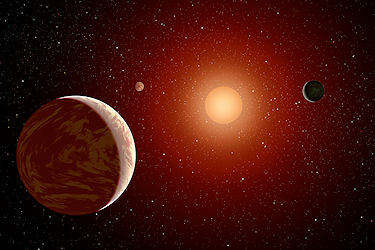 Many exoplanets are detected indirectly by means of their “wobbles” — the gravitational tugs they exert on their central stars. Some are found when they transit the parent star, momentarily dimming the glare, but not dimming it enough to reveal the planet itself. The Galaxy Evolution Explorer Web site at http://www.galex.caltech.edu describes many of the other discoveries and accomplishments of this mission. And for kids, how do astronomers know how far away a star or galaxy is? Play “How Old do I Look” on The Space Place at http://spaceplace.nasa.gov/whats-older and find out! 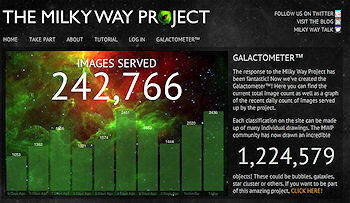 The project's main site (http://www.milkywayproject.org ) includes links to a blog and a site called Milky Way Talk. Here “hunters” can post comments, chat about images they've found, tag the ones they consider especially intriguing, vote for their favorite images (see the winners at http://talk.milkywayproject.org/collections/CMWS00002u ), and more. You can get a preview some of the bubbles at Spitzer’s own web site, http://www.spitzer.caltech.edu/. Kids will enjoy looking for bubbles in space pictures while playing the Spitzer concentration game at http://spaceplace.nasa.gov/spitzer-concentration/. Astronomers have recently found that some galaxies have as many as 2000 small stars for every 1 massive star. They used to think all galaxies had only about 500 small stars for every 1 massive star. News flash: The Census Bureau has found a way to save time and money. Just count the biggest people. For every NBA star like Shaquille O&apos;Neal or Yao Ming, there are about a million ordinary citizens far below the rim. So count the Shaqs, multiply by a million, and the census is done. Astronomers are census-takers, too. They often have to estimate the number and type of stars in a distant galaxy. The problem is, when you look into the distant reaches of the cosmos, the only stars you can see are the biggest and brightest. There&apos;s no alternative. To figure out the total population, you count the supermassive Shaqs and multiply by some correction factor to estimate the number of little guys. The correction factor astronomers use comes from a function called the “IMF” — short for “initial mass function.” The initial mass function tells us the relative number of stars of different masses. For example, for every 20-solar-mass giant born in an interstellar cloud, there ought to be about 100 ordinary sun-like stars. This kind of ratio allows astronomers to conduct a census of all stars even when they can see only the behemoths. NASA&apos;s Galaxy Evolution Explorer, an ultraviolet space telescope dedicated to the study of galaxies, has found proof that small stars are more numerous than previously believed. 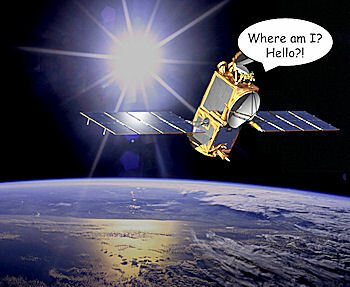 The Galaxy 15 communication satellite was “brainless” for several months in 2010 after being exposed to a geomagnetic storm. The new GOES-R satellite will warn of such dangers. Electrons swirling around Galaxy 15 stuck to and penetrated the spacecraft’s surface. As more and more charged particles accumulated, voltages began to rise, and —zap!— an electrostatic discharge occurred. A zombie was born. The New Moon occurs this week on Friday morning at 2:47 AM CST. Last week we watched the waning crescent moon rise in the eastern sky in the pre-dawn hours, while late this week and early next, we will begin to catch the newly waxing crescent in the western sky starting early Sunday evening. Between now and then, we will be treated to our best dark skies while the Moon is making its monthly pass near the Sun. 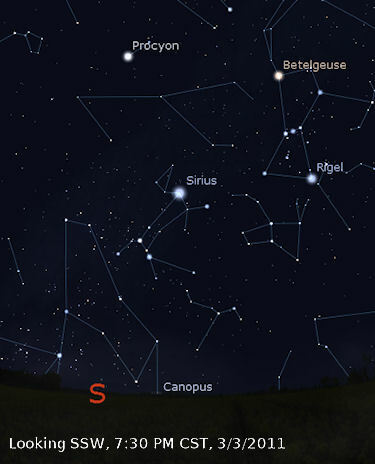 Sirius (α Canis Majoris) shines high in the south during the early evenings in early March. Sirius is the brightest star in our sky at magnitude -1.46. Sirius is known as the Dog Star, due to its position of prominence in the constellation Canis Major, and is actually a binary star system. 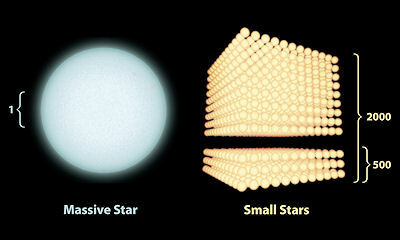 Sirius A, the larger component, is a white main-sequence star, while Sirius B is its white dwarf companion. Sirius marks the bottom apex of the Winter Triangle asterism, which is now directly south of us in early evening. The other two vertices of the Winter Triangle are Procyon (α Canis Minoris,) in Canis Minor, and Betelgeuse (α Orionis) in Orion. Over the course of the month of March, we will see the Winter Triangle appear to move further west each evening if you look at about the same hour of darkness. Don't forget — we switch to Daylight Saving Time on March 13, so the same hour of darkness occurs about an hour and a half later by the end of the month. So if you look at 7:30 PM tomorrow evening, by the end of the month it will be about 9:00 PM before you will see the sky reach the same darkness level. 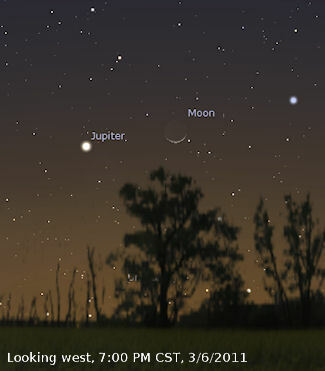 Jupiter is sinking down the western sky this week, just a bit lower each day. By Tuesday evening early next week, Jupiter sets by 8:00 PM CST, so early evening is the best time to catch it. Still brighter than Sirius by quite a bit at magnitude -2.1, it is not nearly as bright as it was in late December. In the meantime, Venus at magnitude -4.1 is almost twice as bright, rising in the east-southeast before dawn this time of year. Since they are not both in the sky together, it is difficult to compare the two without instrumentation. Starting early next week, Mercury is a challenging evening object, and is now very low in bright twilight below Jupiter. Starting Monday, very early in the twilight (about 6:15 PM CST,) if you have a very clear sky and you can find an observing location with a low, clear western horizon (like the eastern shore of a lake,) Look close to the horizon with a pair of binoculars directly below the now-thicker waxing crescent Moon and you may find Mercury as a tiny pin-prick of bright light against the glowing sunset background. 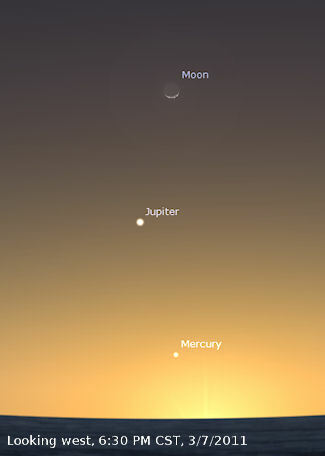 Mercury will set between 6:30 PM and 6:45 PM CST, so you don't have a lot of time to look. The visibility of objects in bright twilight is greatly exaggerated in the accompanying image, but you get the idea. Saturn rises in Virgo around 8 PM CST, but it's best to wait to observe it with a telescope until it gains high altitude, clearing the bad seeing due to the thicker atmosphere at the horizon. Saturn is highest in the south around 2 AM CST. 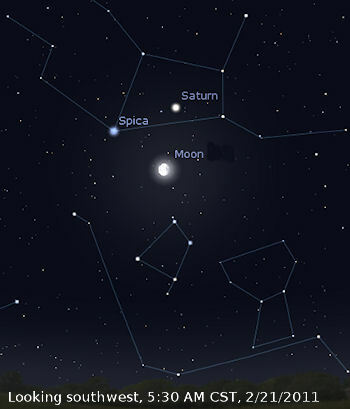 Spica (α Virginis,) slightly fainter, shines about 9° below Saturn all evening and into the early morning hours. Saturn's rings are tilted at about 9.7° with respect to Earth right now, so they should easily be visible in small telescopes. Look for Saturn's moons while you have it centered in your eyepiece. The International Space Station (ISS) will make several bright passes over our area early next week. Look for the ISS to pass low in the NE (from the NNE to the NE) at an altitude of 10° at 7:05 PM CST on Sunday. This pass will be at magnitude -1.0, which is about the same as Regulus in Leo. On Monday evening, the ISS passes over our northern sky at an altitude of 25° at 7:31 PM CST. This time, it will reach magnitude -2.3, or slightly brighter that Venus. Then Tuesday evening, the ISS passes high over our northwestern sky at 7:56 PM, reaching an altitude of 50° and a magnitude of -2.8, which will be brighter than anything else in the sky at that hour. An Astro Safari has been organized to Namibia starting on the 30th April 2011, finishing 9th May 2011. The trip is astronomy-biased with side trips to Namibia's wild life reserves. while the safaris are to be run by experienced safari guides. The flyer, and indeed the entire trip, will be in the English language. For further information, please click on the following link to send an e-mail: icms-online@web.de. 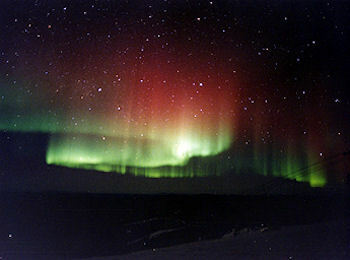 Unfortunately, the chances are much lower for seeing the Aurora Borealis or "northern lights" than were reported earlier. The recent coronal mass ejection (CME, or solar flare) from Sunspot 1158 will hitting our planet's magnetic field for the next 24 - 48 hours. The chances of seeing an aurora at high latitudes (50°N,) are now down to 45%, with much slimmer chances (less than 5%,) that they will reach as low as 35°N, the latitude of NW Arkansas. There will be more chances over the next few years though as the number of CMEs is now on the increase. However, for another unusual treat, sky observers stand a good chance of viewing the Zodiacal Light from Fort Smith and NW Arkansas during the last half of this month. Starting on Saturday evening, find a dark sky location with a clear western horizon, wait for your eyes to dark-adapt, and be prepared to start looking west along the horizon about an hour and a half after sunset. 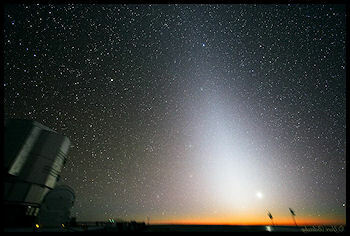 If the zodiacal light is visible, you will see a vague, huge pyramid of softly glowing light sloping toward the south along the line of the ecliptic. Don't give up if you don't see it the first time you go out. This phenomenon will occur in the evenings from Saturday over the next 10 days or so. On Thursday evening, look to the left or lower left of the Moon after dark for Regulus. Farther left of them is Gamma Leonis, not much fainter than Regulus. Look farther to the Moon's lower right for orange Alphard. The Full Moon occurs this week at 2:36 AM CST Friday morning. 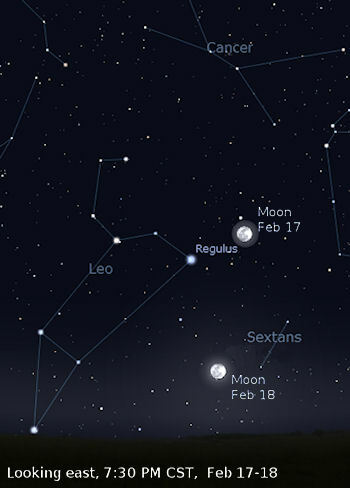 On Friday evening, look for Regulus about a fist-width above the Moon. Regulus marks the bottom-right end of the Sickle (actually the bottom of the Sickle's handle.) The Sickle is an asterism in the constellation Leo. Also on Friday evening, at 6:20 PM CST, look straight to the north toward Polaris to catch Iridium 13 as it flares to an intensely bright magnitude -8.0. At dusk this week, Jupiter shines brightly in the west-southwest and then sets in the west by around 8:00 PM CST. The best time to view it is in late twilight while it's still high. The South Equatorial Belt continues to re-form. Uranus has drifted away from Jupiter to the west and they are now separated by about 6°. They will continue to drift apart as the month progresses. At around 10:30 PM CST this week, Saturn rises in Virgo. By the end of the month, it will rise about an hour earlier. Last month Saturn was less than 8° from Spica, but now Saturn is moving away since it's reached a place in its orbit where it displays apparent retrograde motion. By 3:30 AM CST, Saturn culminates (passes its highest point in the night sky.) Saturn's rings are 10° from edge on, their maximum for this year. 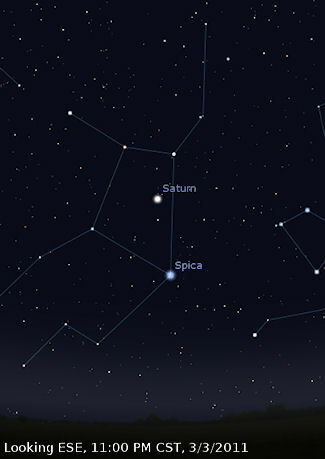 On Monday morning, Feb 21, Saturn and Spica form an equilateral triangle with the Moon in the pre-dawn darkness of the southwester sky. Monday evening at 7:34 PM CST gives us another chance to catch an Iridium Flare, this time Iridium 39, in the south-southeast, also at a brilliant magnitude -8.0. In the east all this week, an hour or so before dawn while the sky is still fully dark, Venus rises and climbs until it is lost in the glow of sunrise. Venus has lost a bit of its luster, dropping from magnitude -4.3 to -4.1 while its phase increases to more than 70% lit, but still remains the brightest object in the morning sky — our "Morning Star". How can this be? Venus is drawing further away from Earth as its phase increases, so the apparent brightness is actually lower. Unfortunately, Mercury, Mars, and Neptune are hidden behind the glare of the Sun this week. The International Space Station (ISS) will also make several passes overhead this week that will be brighter or equal to magnitude -2.5. Saturday evening, at 6:58 PM CST, the ISS at magnitude -2.8, will pass low in the SE at an altitude of 34°. On Sunday at 7:14 PM CST, the ISS will pass mid-way up the NW sky at altitude or 49° also with a brightness of magnitude -2.8. Then on Tuesday evening, it will reach a magnitude of -2.5, again passing mid-way up the sky (42°)in the NW at 6:30 PM CST.